If you read the title of this post pretty carefully, it sounds like I'm calling my own sister a serial killer. However, she is not (thankfully) and I'm no pushover when it comes to cleaning up her mess. 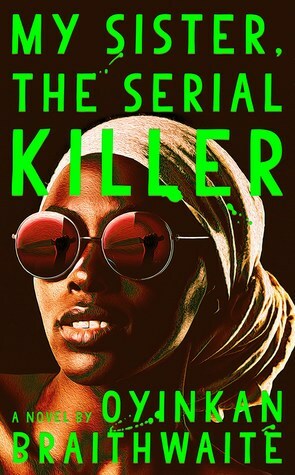 My Sister, The Serial Killer by Oyinka Braitwaith is the story about Ayoola and Korede, two sisters who live in Nigeria and have one major issue; Ayoola tends to kill her ex-boyfriends. When I first read this book, I thought it was going to be a thriller. It was going to be mysterious in the way they kill the boyfriends or Ayoola denies it. I thought maybe Korede didn't know or she had an idea. But the truth is that it isn't a thriller. You know exactly who did the killing, who did the cleaning up, and who is getting away with it. In fact, the only thrill you'll get in this book is whether or not Ayoola and Korede get caught. The story reads more literary and in Korede's POV. However, this doesn't mean the book isn't any good. If anything, it's better than I imagined. The book has layers. It's not a straightforward story about a young woman who kills her ex-boyfriends. It's about the sister, Korede, who cleans up the mess. She's the one who hasn't told anyone but a comatose man about what her sister has done. She feels loyal to her family more than the law. That's the kind of book this is about. The book reminded me a lot of So I Married An Axe Murderer. If you haven't watched that movie, it's about a young man who falls in love with a beautiful young woman who happens to kill her husbands. It's a little twisted, but there's a lot of elements across the two stories that make me think of the movie. It's a good thing! I love that movie. What I thought was interesting were the callbacks to memories with their family. It was a clever way to show how the girls became so close and how their relationship started when they were younger and surviving in their parents' house. It helped to paint the picture between Korede and Ayoola. It showed the over-aggressive father who didn't have a clue how to understand his daughters. It showed how Ayoola shaped into the selfish person she is. It was a lot of questions being answered. I think one of the more infuriating parts of this story is how Korede enables Ayoola. Instead of saying no or telling her not to kill people or even calling the police, I feel like Ayoola just knows she'll get away with it. It's also possibly their sibling dynamic. Korede is always taking care of her younger sister and Ayoola always got away with everything.